1) The Year saw the death of Peter Lawrence Forey (May 1945- January 25, 2016), who had cancer for the last two years of his life. Forey was a phylogeneticist and fish palaeobiologist for many years at the Natural History Museum of London (UK). He was especially interested in coelacanths and was well-known and famed for his work, History of the Coelacanth Fishes, which appeared in 1998. 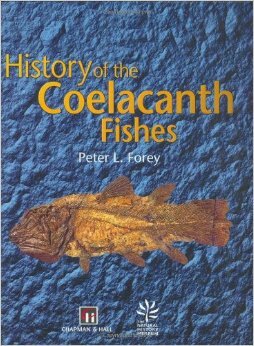 His influential work included the 1984 paper, “The coelacanth as a living fossil,” in Eldredge, N., Stanley, S.M. (eds) Living Fossils, (Springer Verlag, New York). 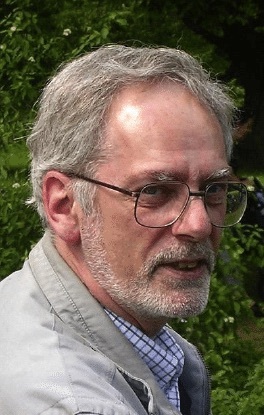 Peter Forey was one of the world’s leading palaeoichthyologists and at the forefront of the cladistics revolution in the 1980s. Together with Don Rosen, Colin Patterson and Brian Gardiner, he was known as one of the “Gang of Four” whose arguments in favor of phylogenetic systematics as a guiding principle in evolutionary biology earned them opprobrium and praise in equal measure, with the added benefit of being firmly on the winning side of the debate. As a result, Forey was one of the guiding lights in vertebrate palaeontology in general, although, according to his friends and associates, he was far too modest and self-effacing to do so. Forey began his career under the training of Brian Gardiner at the University of London (Queen Elizabeth College), earning his PhD on elopiform fishes, a group he continued to work on throughout his career. Forey was an accomplished artist, a craft he discovered from studying and painting fish. 2) During the year 2016, it was revealed a few months previously, a coelacanth skull was found, wrapped in newspapers in a large cardboard box, in the basement of the Museo Civico di Storia Naturale di Comiso on the Isle of Sicily, Italy, in the Mediterranean Sea. On the accompanying note was written: “Tulear, Baie De Saint Augustin, Madagascar, 1987.” No information has been discovered about the collector, and it is assumed to come from a local scientist who often had contacts with French zoologists. If the label is the original one, like it seems to be, then it would be the actual first coelacanth catch in Madagascar since the alleged “first catch known to science” dates from August 5, 1995 (CCC 173) when a coelacanth was netted in Anakao. 3.) 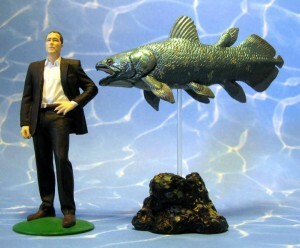 Regarding other coelacanths in Italy, three coelacanths in the Museum of Torino are “out of view” since the Museum closed in August 2013, due to security reasons and rebuilding. 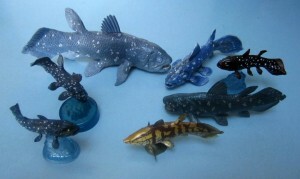 Attempts in 2016, by Dr. Erik Domini, who collected these specimens, to bring them temporarily to the Museum of Asta (where he lives) were unsuccessful. 4.) 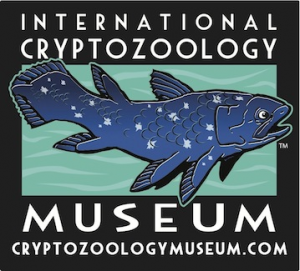 The museum in Trieste, northeastern Italy, celebrated on December 10, 2016, the fact that 35 years ago they put their coelacanth specimen on display. 6.) 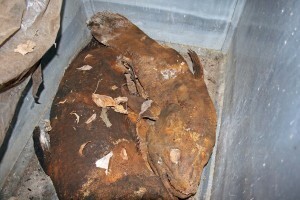 Tourists discovered a coelacanth in a holiday residence at Sarodrano, Madagascar. 8.) The specimen CCC4, originally stored at the Biological Institute of the University of Antananarivo has been rediscovered in the Museum at Tsimbazaza-Antananarivo. It was at this place, Tsimbazaza, where the Institute was built thanks to the efforts of French scientist Jacques Millot. 9.) In August 2016, the Indonesian specimen CCC299 went to the Fukushima Aquamarine in Japan for dissection and study under supervision of Masa Iwata. It will be returned to Indonesia after study. 10.) 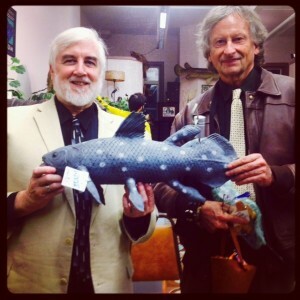 Dinofish director Jerome Hamlin (shown on right, below) presented a global overview of possible cryptid coelacanth habitats throughout the world. 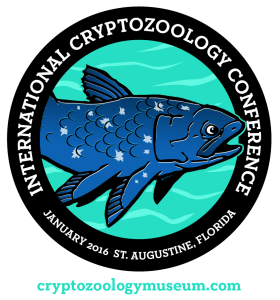 He also told of his search efforts to discover new specimens at the First International Cryptozoology Conference in St. Augustine, Florida, in January 2016. Great appreciation is sent to Belgian coelacanthist Rik Nulens, who shares an annual review of news and bibliographical data on coelacanths.